Macy's signs contract with the Cincinnati Etiquette &Leadership Institute, LLC to present business etiquette training at their headquarters in New York City. 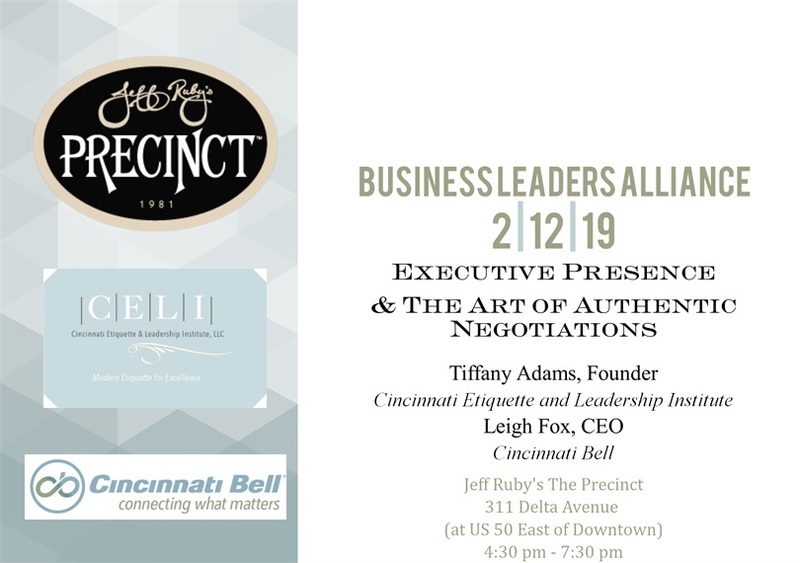 Tiffany Adams, CELI President, and Leigh Fox, President & CEO of Cincinnati Bell. CELI presents "Leadership at Its Finest" series to the Cincinnati Bell executive leadership team. — C. Richards, Ferguson Inc.
L to R: Dan Heitger, Business Leadership Alliance (BLA) Co-Director & Miami University Professor, Tiffany Adams, CELI President, Leigh Fox, CEO & President of Cincinnati Bell, and Brian Ballou, BLA Co-Director & Miami University Farmer School of Business Professor. CELI presents "Corporate Etiquette & the Art of Distinguished Dining" workshop to the Business Courier's Bizwomen Cabinet Leaders at the lovely Manor House. CELI conducts "Working a Room with a Plan" workshop for Graydon Head who "looks forward to exploring future collaborations." CELI facilitated a high-energy, interactive, useful workshop for our attorneys on how to navigate a networking event successfully, followed by a professionally-guided social hour at which the attorneys practiced their new skills. Everyone present said they gained new confidence, and learned things they could immediately put to good use at their next networking event. Many noted that once their mindset was changed from viewing their role at a networking event as just “selling,” to instead as a chance to “build meaningful relationships and help people,” they now look forward with enthusiasm, rather than dread, to their next networking opportunity. First Financial Bank partners with CELI to instill excellence in their Retail Management Development Program. PNC Bank President, Kay Geiger, Pam Weber and Women Connect supports female entrepreneurship by engaging CELI's training services. CELI presents "Women's Leadership: Catalyzing Your Personal Brand" workshop. ”Powerful message with lots to take away! Dinsmore attorneys engage CELI's services for business etiquette workshop at The Aronoff Center for the Arts. CELI is honored to be invited back to empower Dinsmore attorneys with high distinction and excellence. Messer Construction Co. engages CELI business etiquette training. Personal Branding was a key theme in accentuating building their professional image. The learning journey was customized to complement Messer's motto: "We Are Building." CELI is honored to partner with the Cincinnati USA Regional Chamber in presenting to the inaugural class of Cincy Next, a new group of inspiring business leaders. Julie Bernzott, HYPE Program Manager, and Jessica Baron, Senior Director, from the Chamber pose with Tiffany Adams, CELI President. "The Competitive Advantage: Distinguished Dining" was presented to 38 Cincy Next members at the Metropolitan Club. Tiffany Adams presents CELI's training programs to the Cincinnati Reds' wives and meets the lovely Rosie Red. CELI conducts business etiquette training for 34 Best Upon Request employees. Pictured above with Tiffany Adams, CELI President, is Tillie Hidalgo Lima, CEO/President, and the leadership team of Best Upon Request. Honored to present an international protocol workshop to 50 faculty members of Miami University for their Global Initiatives Department. The Cincinnati Etiquette & Leadership Institute, LLC (CELI) presented, "Working and Interacting in a Global Workplace" with a country-specific focus on China and India. Cincinnati Hills Christian Academy (CHCA) Middle School students attends CELI's "The Competitive Advantage: Distinguished Dining" class at deSha's Restaurant. A subsequent CELI workshop was also conducted for CHCA High School students. A privilege to partner with Wells Fargo Advisors for two workshops of "The Competitive Advantage: Business Etiquette." Tiffany L. Adams, President of the Cincinnati Etiquette & Leadership Institute, LLC, shown with graduation class of 2014 at the Protocol School of Washington® conference in Washington, D.C.
CELI partners again with Northwestern Mutual for another successful training presentation. These interns learned that the key to career advancement is interacting successfully with others in the workplace. The skills taught in “The Competitive Advantage: Business Etiquette” seminar empowers our clients to confidently interact and also show respect in the workplace.